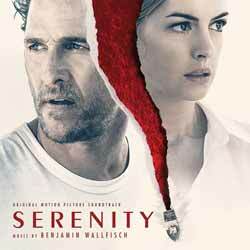 The soundtrack to Serenity represents a collection of mellow, atmospheric themes. One that, on a first play through I enjoyed, but didn't find overly impressive. It was only on repeat listens that the subtle elements worked their way to the surface. Composer Benjamin Wallfisch (Annabelle: Creation; Bilby; Bhopal: A Prayer for Rain; Conquest 1453; Desert Dancer; The Escapist; Gamba; Hammer of the Gods; IT; Pressure; The Thirteenth Tale) is a composer whose work I always look forward to hearing. Mainly because he has an ability to get under the listener's skin by crafting emotionally fragile and heartbreakingly beautiful music. The album consists of 19 tracks (1 hr, 02 min, 59 sec) and while on a first listen it sounds a little shallow, stick with it because the rewards are worth it. Tracks like 'Karen' are instantly accessible, as is 'Deliver Me From Temptation' which, while atmospheric, also throws quite a lot of subtle genre changes at the listener. If deep, richly rewarding scores are your thing, then you really should grab a copy. Wallfisch surprised me with this one and I nearly overlooked its importance as a wonderful piece of cinematic music that manages to stand on its own two feet outside the film.